Vega's self-titled debut album was released in 1985 and was well-received by critics in the U.S. and it reached platinum status in the United Kingdom. 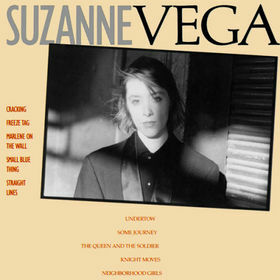 Produced by Lenny Kaye and Steve Addabbo, the songs feature Vega's acoustic guitar in straightforward arrangements. A video was released for the album's song "Marlene on the Wall", which went into MTV and VH1's rotations.